We had something similar to this at a Yelp Elite Event a few months back and I loved it and bookmarked the idea in my brain. In addition to being delicious, this recipe is fairly quick which makes it a good weeknight meal. I would like to point out that this is dairy free, as in no cheese. NO CHEESE. I mean, I love cheese. LOVE IT. But these toppings are good to go on their own. My honey and I discussed this fact while eating it and decided that it really doesn't need any cheese. If you can't imagine enjoying a pizza sans cheese, throw a little shredded parmesan on top before slicing and serving...but I seriously don't think it needs it. 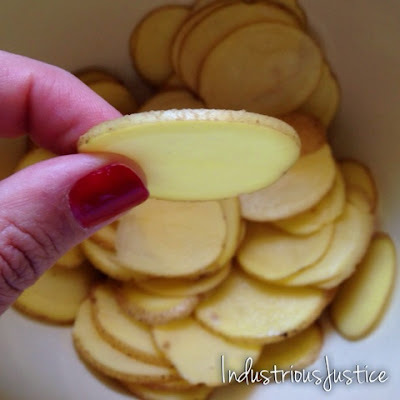 Slice those potatoes super duper thin. I used a mandolin. We have one like this. Layer everything as evenly as possible. Put the minced garlic in between the layer of potatoes and brussels sprouts...that way it will get cooked but not too brown in the oven. 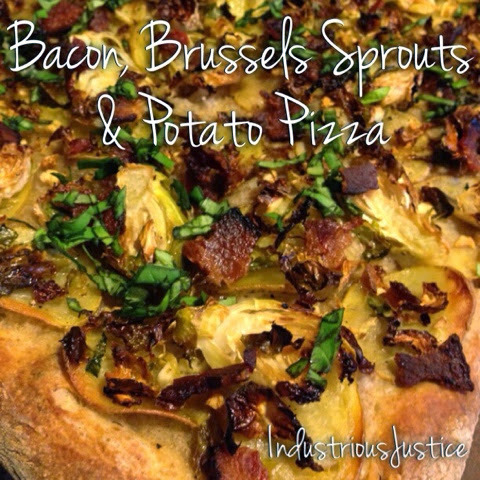 Basil is awesome on this pizza but you could sub fresh parsley. Just use something fresh. It adds great flavor and color. Cook the bacon: Place bacon slices on a foil-lined baking sheet. Cook for 15-20 minutes in a 400º F not pre-heated oven, until the bacon is almost as crispy as you like it. (It will cook a bit more on the pizza.) Once bacon is cooked, remove to a paper towel lined plate to drain. Increase oven temperature to 425º F.
While the bacon is sizzling away in the oven, prepare your other ingredients. Toss the extra thin slices of potato in a bowl with 1/2 tablespoon olive oil and a bit of salt and pepper. Place potato slices in a single layer on the prepared pizza crust. 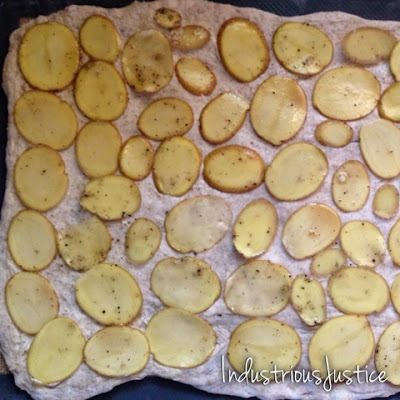 Sprinkle minced garlic evenly over the top of the potato slices. In the now empty bowl, toss the shredded brussels sprouts with remaining olive oil and layer brussels sprouts evenly over the potato. Crumble the cooked bacon over the top of the pizza. 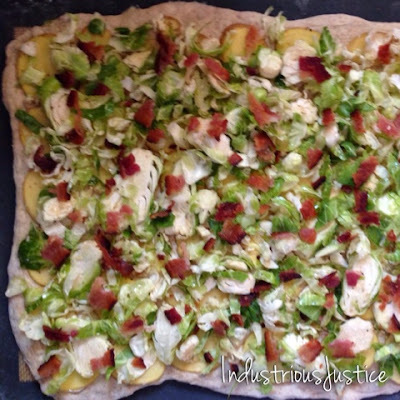 Bake pizza on a pizza stone or parchment-lined baking sheet for 10-12 minutes, until crust is browned and potatoes and brussels sprouts are softened. 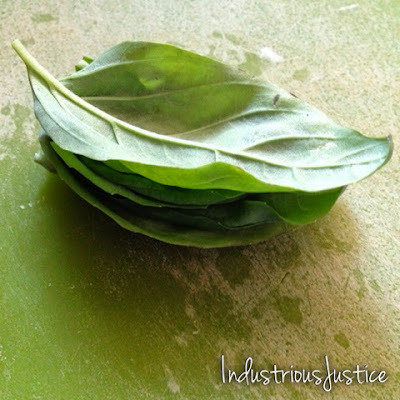 Remove pizza from oven and sprinkle with fresh basil and parmesan, if using. Sooooo that blog once a week goal? Not going quite as planned. I start grad school (yay!) at the end of this month, which I anticipate will be fantastic but will add another priority to my life. A priority that will definitely come before my blog. In the meantime, I will try to post more over the next few weeks. Up now...two ideas for super easy and healthy breakfasts. I know it may sound strange but coming across this way of preparing eggs was seriously life changing. I make up a huge batch and have hard boiled eggs for a week. A hard boiled egg or two plus some fresh fruit is my favorite workday breakfast. Now, I realize that making hard boiled eggs the traditional, stove-top way isn't particularly difficult but these are so super duper easy and are mostly hands off, freeing you up to do other food prep. Also, they are always cooked perfectly and nine times out of ten the shell just comes right off. Below are the instructions for oven baked eggs, as well as a specific (delicious) use for two of them. 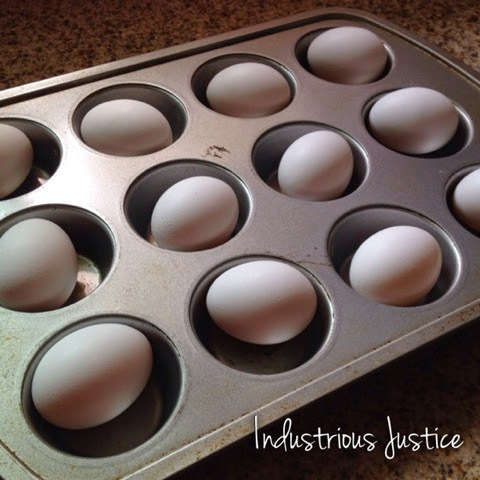 Place however many eggs you'd like to make in the muffin tin -- one egg per section. Remove from oven and immediately place eggs in the bowl of ice water to cool. *30 minutes is perfect for our oven. You may want to test a few smaller batches to figure out what works best for you. Place the bread in a toaster or toaster oven. While the toast is toasting, combine the chopped egg whites, greek yogurt and mustard in a small bowl. Season with salt and pepper to taste, and add a few dashes hot sauce if using. 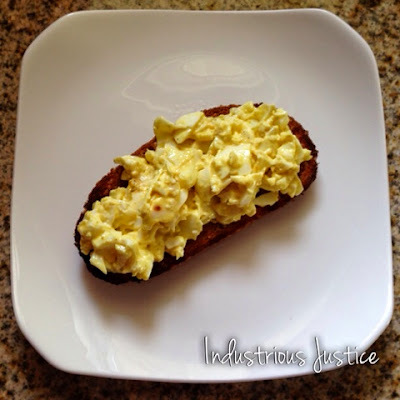 Once the toast is ready, top with the egg salad and slices of avocado, if using.